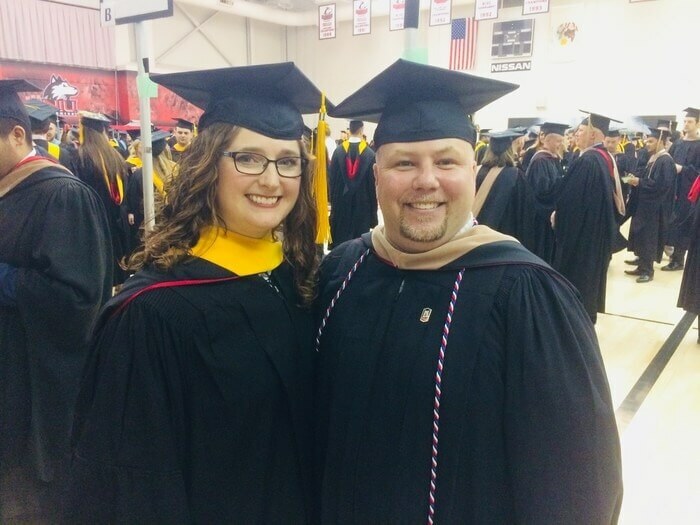 More than two decades after earning their Round Lake High School diplomas together, NIU’s director of Campus Child Care Kristin Schulz and her longtime friend Mike Lannon can call themselves fellow graduates again. Both graduated Friday, May 11, with master’s degrees from Northern Illinois University. Neither of the 1996 Round Lake High School graduates knew of the other’s efforts to earn master’s degrees until about two years ago when they ran into each other at a 20-year high school reunion. “It was, ‘Hey, I’m going to school.’ ‘So am I,'” Schulz remembered. The two kept in touch afterward and recently learned they’d actually be graduating on the same day. Schulz earned her master’s degree in Applied Family and Child Studies, while Lannon earned his Master of Business Administration from NIU. “I feel really proud of the two of us, and I think we’re encouraging a couple of other people, too,” said Schulz, who aims to use her master’s degree to help families succeed both at the university and as parents. Schulz began working at Campus Child Care in 2004 as an assistant teacher. The two posted a photo from their graduation day together on social media, and received an outpouring of responses from former classmates complimenting the duo’s Round Lake “Panther pride” and even musing about going back to school themselves. “I just think it’s cool to be able to represent where we grew up and to really just kind of showcase that at any point in your life you can make a difference and get an education,” Schulz said. Schulz started working on her master’s degree about six years ago, while Lannon, of Antioch, earned his bachelor’s degree in 2014. He then pursued his graduate degree, earning it in two years. Lannon is a military veteran who served in the U.S. Marine Corps from 1998 to 2002. He, too, is proud of the fact two Round Lake High School grads went on to earn master’s degrees. There aren’t many from their class who did, maybe five or six, Lannon said. “The fact two of us went to the same school and graduated at the same time, it’s, ‘Hey, what are the chances of this? '” Lannon said. “It was so fun to see him, just a cool thing,” Schulz added.